I woke up much earlier than normal. Showered, and ran downstairs to make some instant coffee. I got dressed in a dress and black blazer, and actually blow dried my hair to make it more presentable. Red woke up during this time. She is always the early riser of the bunch. She was a bit cranky. Since she was cranky we went back into her room to find her note. I sat with her and read it to her and told her Big Bro received a note so I HAD to leave a note for her too. She looked at me and started to smile – still holding it in but then jumped on my lap and gave me the biggest hug. That made my morning and the feeling will help me through the morning since I didn’t have time with my other children. The ride to the airport was easy – we live very close. I parked in the hourly parking lot. Grabbed fruit, yogurt, coffee, and juice – the best breakfast ever. I ACTUALLY ATE!!! AND I DIDN’T HAVE TO WORRY ABOUT ANYONE EXCEPT FOR MYSELF!!! Now on flight. And its quiet! I don’t have any kids jumping around or trying to run down the isles or looking behind or kicking the seat in front or needing an activity or complaining that they are hungry/thirsty/tired!!!!!!!!!!!!!!!!!!!! However, I do need to prepare for a major presentation I will give 3 hours from now. Met up with Director and grabbed a taxi to the client. Looked through presentation and made some last notes to myself for talking points. Met with client 1/2 hour before the meeting so she could give last minute guidance; also sold the concept of another project to her and she is excited and completely on board. She needs to coordinate with some others in the organization but it looks like we can add them to our list of interested participants in the study we are jointly conducting with our partner. YEAH!!! Had a 1 hour presentation where we presented some very sensitive material. I tactfully handled areas of sensitivity that I knew of, however there was a person on the phone who was not part of the process at all and was extremely defensive. We were challenged by him since 1) we tried to include him in our previous interviews/discussions but he sent a proxy instead — so he was working with us on the first time with a lot of these issues; and 2) he was on the phone and not face-to-face. Face to face with these kinds of meetings is so much better so you can establish actual connections to the people. In the end though the leadership gave us high accolades, again, so we felt good about the work. Continued the proposal on the plane; talked business with the guy next to me — he had some ideas for this Blog so I am grateful for meeting him. Grabbed another beer — the day is getting better and better. Grab car – head home. I go to ferry station to drop off the Audi and pick up the mini-van. 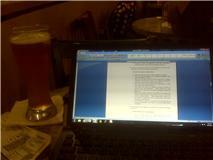 Head home and continue to work on the proposal for another hour. Get it to a point where I can email to a Director on East Coast so he will look at it and then give me his feedback (he is 3 hours ahead of me which works well). Talk to Hubby. The plan is for me to pick up the kids and get to the ferry station in time for them to see the boat arrive. I’m on my way!!! Red was wearing her pajamas from the night before – I guess Hubby had a hard time dressing her this AM. Then I notice that Big Bro is wearing the same shirt as yesterday (that he also slept in). I’m wondering if he at least changed his underwear and socks? Oh well. Ferry came in and all kids were fixated on the boat, and seeing Daddy. At home with everyone! I played with kids; tickled, hugged, laughed, ran, I love the reunions. Red needed to pee and wanted privacy; Twin Crazy was running around; Big Bro was playing with a beach-ball “globe”; Twin Husky was cranky — wanting Daddy and his doggie blanket. So, it was an unusual travel day with significant work presentations… hubby had to pick up the slack in the AM for me to be able to even do any of this. The kids looked good and healthy – they were a bit smelly from old clothes but that is the least of my concerns. We were happy to be back together and getting back into our normal routine together.